1 in 15 chance of being Viewer's choice at Fall Paducah!!!!!!!! “All you need is Love” is one of fifteen quilts at the Fall Paducah show that can be voted on by you and anyone you know who loves quilts, to receive a top Viewers Choice award. Many of you read the story of this quilt in this months newsletter. Immediately upon seeing Cynthia Baldauf’s photo on the cover of the National Geographic catalogue, I found her name and began my internet search. Facebook gave me a contact link. I messaged her to ask - What she would charge for permission to use her “artful photo” as inspiration. She wrote back, asking what photo I was talking about? What photo! “Your photo is on the cover of the National Geographic Catalogue. It brought tears to my eyes and has filled my heart. How on earth were you able to capture that moment? 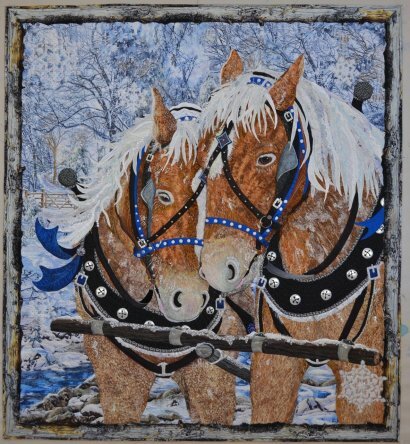 Cynthia and I plan to meet in person to share “our quilt” with others at the international quilt show in Paducah, KY. We just received news that our quilt is up for one of 15 chosen by the judges and placed in contention for Best of Show and other Viewer Choice top awards. You have this week to vote. Anyone with an email address can cast a VOTE – use your Smartphone, iPad, home computer, or vote at the show. Anyone can vote – so get your family and friends excited about quilting. Have them pick their Viewer's Choice! This link will take you to the Voting page and the count down clock. Voting will open at 6:00 p.m. (CT) on Tuesday, September 12, 2017.- Voting closes at 12:00 noon (CT) on Friday, September 15, 2017. Beginning at 6:00 p.m. (Central Time) on Tuesday, September 12, 2017, the 15 First Place winners, will be available online for voting. When voting is opened, a link to vote will be available on quiltweek.com and on the American Quilter’s Society page on Facebook. The quilt with the most votes will be named the Janome America Best of Show. • The wall quilt with the most votes will be named the Gammill Best Wall Quilt. • The next five quilts with the most votes will be named:Baby Lock USA 1st Place Overall AQS 2nd Place Overall, Innova 3rd Place Overall, APQS 4th Place Overall Hobbs Bonded Fibers 5th Place Overall. I have always said that Viewers Choice was the very best award. I am over the moon with excitement and so is Cynthia.